We have seen hash implementation in Array , where we can fill only one value in one slot. If new value comes it overwrites previous value. But using collision resolution by linked list we can resolve this problem and preserve the values. Whenever new value comes to the slot which is already filled then we can put new value in linked list associated with that slot. In this method performance degrades when more values are matching with same slot. 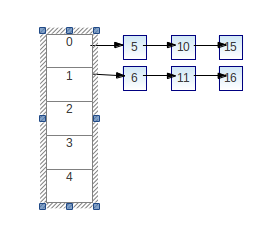 The below picture is for hash table with collision resolution using channed linked list.